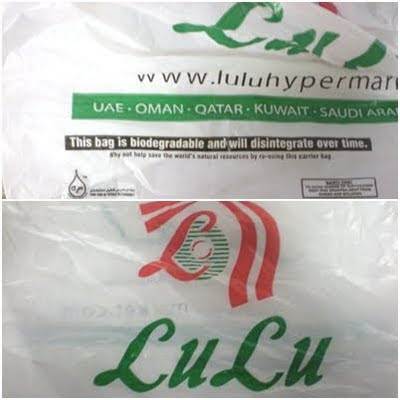 Dubai Photo Story: Lulu goes green? May be not!! Lulu hypermarket located at Al Barsha has now won my loyalty. After having been a regular customer at one of the other chains for many years, I have finally made the shift. Lulu hypermarket is where I shop for my groceries now. That itself is not the main story. Even though I have been to the outlet several times in the past 2 months, I had not noticed a small message on all the plastic bags that they hand out at the exit. Apparently, the plastic bags are 'biodegradable' and will disintegrate over time!!!. Many of the other supermarket chains have either stopped handing out plastic bags or are strongly promoting jute bags at the counter. And here is a supermarket that is subtly 'promoting' the use of plastics bags. Now when I pick up that plastic bag, I will probably not feel as guilty given that the fact that the bag is biodegradable. The word 'biodegradable' may be interpreted by many as 'eco friendly' but is it?